Increasing productivity, commitment of employees or improving the working environment has always been in the minds of entrepreneurs. However, how to do it has always been an unknown, as well as the tools or the methodology for that purpose. One of the methods most used to “increase productivity” throughout history has been control over workers (Jódar and Alós, 2008). Many authors (Peña, 2004) agree that as humans we have a tendency to control the environment and ourselves, seeking to eliminate insecurities, increase our ego or simply feel less dependent on certain factors. This in psychology is called “Need for a sense of control”. In this context we present the other side of the coin: being controlled (by the company), since of course the feeling of loss of freedom negatively affects the individual, in addition to altering the perception that he has of the company. We can consider a scale of the level of control of organizations. On one side there are a control freaks of companies with excessive control, in which the worker feels that he is forced to work and he is only there because his economic necessity and he is limited to just following “from-the-top” orders. On the other side, there are those (horizontal) companies that share control with workers, increasing their autonomy (companies such as Zappos, Google y Twitter). At this point, we can establish certain basic premises by relating the level of control and productivity. In fact we can find many examples around us. In a daily life level we can observe that if we do something that comes from ourselves we do it in a much more efficient way than if we are ordered, and scientifically, there are many empirical studies that already demonstrated how this phenomenon has propitiated a in leadership (Mendoza et al. , 2007). This new paradigm is associated with a greater sense of control of the individual, as well as an improvement in work performance (Howell and Avolio, 1993). The way organizations are perceived is key to the productive process, since intrinsic motivation (the prime motor for productivity) decreases the more control exercised by the company over the workers. Due to the evolution of the labour market and human resources systems, is possible to observe the need to give more value to employees and give them more decision-making power and motivation. According with some authors what is also perceived is that more autonomy and control the employees have, more productive they are and more increases their sense of belonging. To emphasize, Deci and Ryan (1985) already explained through their theory of self-determination (TAD) that there are three psychological needs to be satisfied for individuals to develop himself both personally and professionally: autonomy, feel competent and relate with others. We invite the reader to think about the importance of the motivation of the worker linked to productivity. To do this, we present the latest Gallup State of the Global Workplace survey (O’Boyle and Harter, 2013), which stated that 63% of the world’s employees are unmotivated, hence they will devote less effort to achieve the objectives of their organizations. Additionally, 24% of them are actively demotivated, that means that in addition of being unmotivated and unproductive, they are prone to spreading negativity to their co-workers. Actually, there are already a lot of cases of success where it is argued that the company provides self-management tools to workers or reinforces and motivates them in an additional ways, not only through economic rewards. This is the way followed by GAMeeP (Gamified Employee Engagement). GAMeeP is a Research Project in the area of quality of working life, co-financed by the Center for Industrial Technological Development (CDTI) (2015-2017) in the framework of research and development projects and the European Regional Development Fund (FEDER) of the FEDER 2014-20 smart growth program. The project proposes a computerized system of team management which challenge is to improve the quality of working life and increase the overall productivity in addition to simplify the management of human resources while increases the sense of well-being and commitment of employees. In the context of games, a study by Ryan, Rigby, and Przybylski (2006) concludes that individuals are attracted to play in part because we experience autonomy, competence, and interrelation when we play (precisely the three psychological needs mentioned previously by TAD). The gamified design of the platform allows each worker to auto-assign tasks (from a list of available tasks). Consequently here we are empowering the autonomy of the workers, giving them to choose what they want to do. The accomplishment of this tasks will be rewarded with points taking into account the quality of the tasks and the time it takes to deliver them, not only penalizing the players / workers, decreasing the amount of points they earn if they do not complete the tasks in time, but they win also more points to finish the task before the deadline. Above all the reward system there is always a team manager, in this case under the name of “master”. Her functions, plus creating and managing the tasks, also contemplate the creation of the different incentives (the only limit here is the imagination). In addition, we added a well-known competition mechanic in order to enhance the productivity of certain player profiles: the ranking. The platform allows the opening and closing of competitions in which the system itself generates a classification of players according to their performance and more indicators during competitions. To demonstrate that our system actually improves the productivity, we carried out an experiment. With a pre-post test model and two experimental groups (total users = 13), we measured different indicators, expecting an improvement of all of them. On one hand: Autonomy, Competence and interrelationship (measured with the Spanish version of the Scale of satisfaction of basic psychological needs at work, Vargas Téllez and Soto Patiño, 2013, Deci & Ryan, 2000). 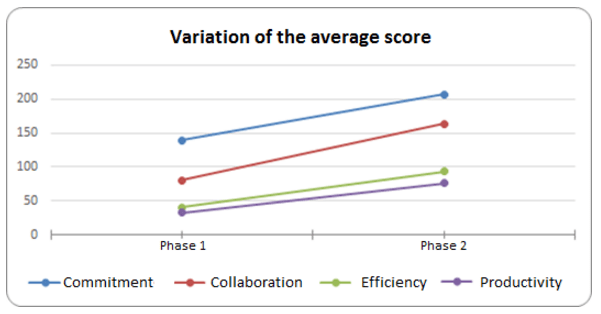 On the other hand, performance indicators: Implication / Commitment, Collaboration, Efficiency, Productivity (measured based on the points earned within the platform and with the objective vision of the project manager of the experimental groups). However, after the statistical analysis of the data, only the increase in Competition in one of the two groups was significant (t = -2.316, p = 0.04). 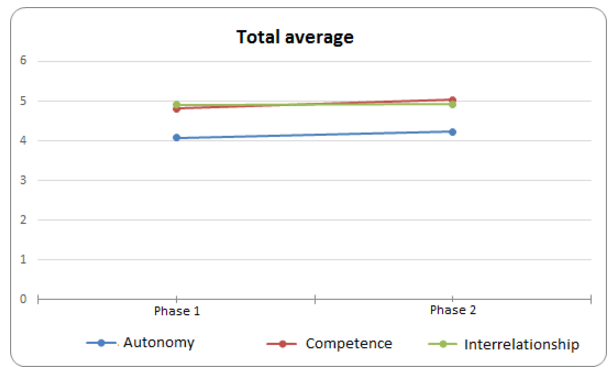 Although, we also highlight the quasi-significance of the differences in autonomy in the same group (t = -1.805, p = 0.065) and differences in the total competency measures (t = -1,362, p = 0.09). A significant increase in Commitment levels (t = -2.724, p = 0.02). A significant increase in Collaboration levels (t = -4.290, p = 0.003). An almost significant increase in Efficiency levels (t = -1.915, p = 0.056). A significant increase in Productivity levels (t = -2.247, p = 0.037). Summarizing the results of the whole dataset, we can see in general that gamification has had a moderate positive impact. Specifically, users were more committed, collaborators and productive. Moreover, the platform increases levels of competition in just certain contexts. GAMeeP, as a model of work team management, has proved to be a useful tool to boost employees motivation. Furthermore it promotes certain business values such as competition, in line with the theories exposed in this article. Nevertheless we do not stop the evolution of the project at this point. We are conscious that the world will continue to change just like companies and also the styles of leadership. With this change seen and foreseen, we can see current and future market’s needs (especially in certain sectors such as entertainment, technologies, contents, etc.). At present, where the information era gives the way to the era of people and talent, the workers identify their skills to improve (of a creative nature) and, from companies, new models (such as GAMeeP) to enhance humanity and certain methodologies that lead to greater job satisfaction and productivity arise. Vargas Téllez, J. A. and Soto Patiño, J. C. (2013). Validación preliminar de la Escala de Satisfacción de Necesidades Básicas en el Trabajo (Basic Need Satisfaction at Work). Versión en español. In: XVII CONGRESO INTERNACIONAL EN CIENCIAS ADMINISTRATIVAS. Guadalajara, México. This entry was posted in Engagement, Gamification, Work and tagged Engagement, extrinsic motivation, Gamification, workplace. Bookmark the permalink.